Water is one of the essential requirements for the existence of life as it connects all of its aspects. Pakistan, once a water-abundant country, is now experiencing water scarcity. Water scarcity is the shortage of water resources to meet the demands of water usage within a certain area, and this problem is among the key challenges faced by Pakistan. No person in Pakistan, whether from the north—with its 5000 glaciers—or from the south with its ‘hyper deserts’, will be immune to this scarcity. Access to safe water and sanitation and sound management of freshwater ecosystems are essential to human health and to environmental sustainability and economic prosperity. One of the reasons for this crisis is the mismanagement of water resources. According to Indus River System Authority (IRSA), due to non-construction of water reservoirs, a huge amount of water having an approximate economic value of $21 billion is being thrown into sea every year. Moreover poor infrastructure of water e.g. leaky dams and canals, pollution of water due to the improperly disposed waste, and lack of awareness of current situation has led to the worsening of this problem. Due to urbanization and overpopulation, per capita access to water is expected to continue to decline in the years ahead. Pakistan’s population is expected to increase from 190 million to 230 million by 2030 while its urban population has increased from 38.3% (2014) to 46.6% (2015) and about 17 cities have more than 1 million population. Due to the rapidly increasing rates of this mobility, demands cannot be met. water, having an approximate economic value of $21 billion, is being thrown into sea every year. Among other factors that are contributing to the water stress in the country, climate change is an important one to be considered. According to Global Climate Risk Index (2016), Pakistan is the eighth most vulnerable country in the world due to climate change. Himalayan glaciers—a major source of water supply in Pakistan—are melting rapidly while riverbeds are drying up across the country. The devastating impact of climate change on water sources will ultimately affect other sectors including agriculture and energy production. Pakistan has an agro-based economy and the world’s largest irrigation system. This system irrigates over 16 million hectares of land out of 34 million hectares of cultivable land that is available. 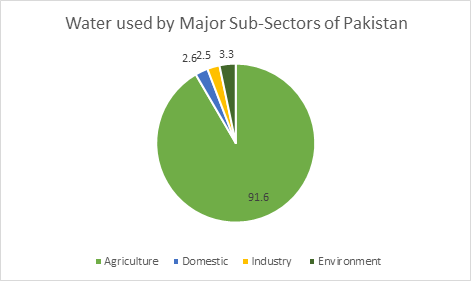 It is estimated that about 91.6% of the water in the country is used in agriculture sector and about 70% of the population is directly or indirectly involved in this sector. Moreover this sector contributes approximately 22% of National Gross Domestic Product (GDP). 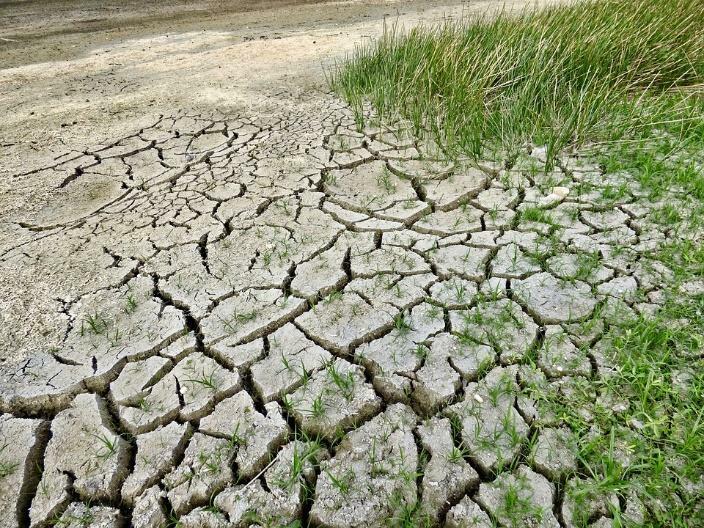 Climate changes and global warming are expected to increase crop water requirement and less availability of water could significantly reduce the yield of Pakistan’s main cash crops like wheat, sugarcane, maize, cotton, and rice. All of this signifies that the effect of water scarcity on country’s economy will be immense. Climate change will also affect the energy sector because at present there is about 70% thermal power production in Pakistan that is highly dependent on water and sensitive to increased temperatures. Due to climate changes, increase in air temperature may affect the overall efficiency of a thermal conversion process, consequently reducing the electricity production. The water crisis has also started affecting the generation of hydro-electricity. Political procrastination has also been one of the very major reasons accounting for the current intensity of the crisis. The governments of the past and even the current government have shown little interest in the water issue. For a long time, no new bodies were made to take care of the declining situation, and no new methods were devised to tackle this problem in the near future. Small political disagreements—now turned into huge issues—have held back the construction of many dams and reservoirs in the country. The construction of the infamous Kalabagh dam has been under debate since the past 14 years. Three to four ruling parties of two provinces of the country—namely, KPK and Sindh—disagree with its construction, reasoning that it would be an injustice for the smaller provinces, leading to a severe drought and turning their land barren. Three provincial assemblies have already passed resolutions against the construction of not only the proposed dam but any dam—near the Tarbela downstream—which blocks the flow of water to the concerned provinces. If water had been prioritized it could have served as the engine of economic growth and regional trade expansion. The water economy had the potential to increase total annual agricultural GDP to $200 billion from its current $50 billion. Apart from the shortage of water, the contamination of water is also an important issue. 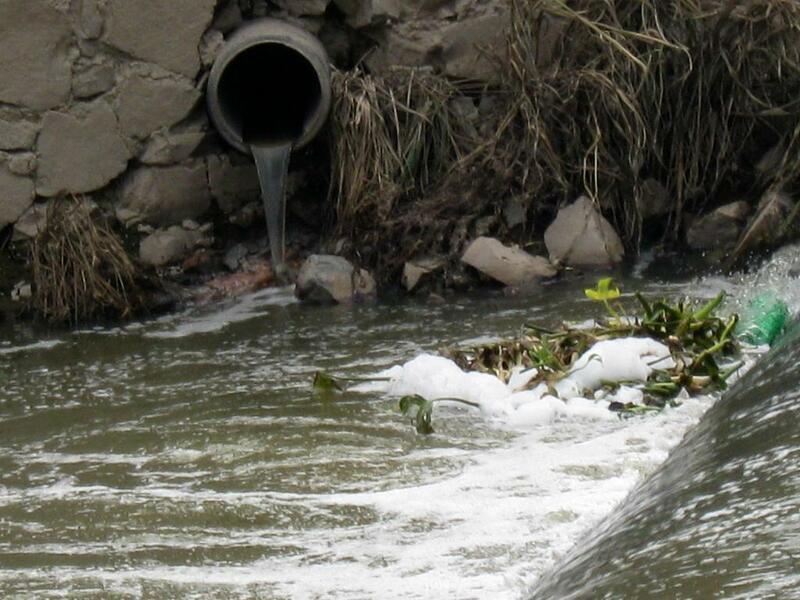 Human activities like improper disposal of domestic and industrial wastes and excessive use of agrochemicals in agriculture sector, are causing the deterioration of water quality. In big cities like Lahore, Karachi, Islamabad, about 70% of available water is considered unsafe for human health. The intensity of this matter can be seen from the fact that at the time of independence of Pakistan, 5000 cubic meters per citizen of clean water was available. Now there is less than 1000 cubic meters of clean water per citizen. Pakistan is among the five countries that have the highest rate of diarrheal deaths and every year about three million people suffer from waterborne diseases. To avoid water scarcity, we must take drastic actions. In order to preserve water, there is a need to spread awareness among people about the importance of conservation and judicious use of water. For the construction of water reservoirs, policies must be formulated. To make better use of river and sea water, government should set up desalination plants. In agriculture, more water conserving technologies and efficient methods like drip irrigation should be promoted and the loss of water due to leakage of dams and canals should be reduced by proper maintenance like lining the canals. In canal lining, an impermeable layer is provided at the beds and sides of canal to avoid seepage loss and weed growth, and to improve the overall efficiency of irrigation system. There is also a need to set up water treatment plants to utilize water savings from agriculture sector and make water useable for domestic and industrial activities. The current curriculum of water and agricultural institutions must be changed accordingly for the sustainable development in the country and other regions that are suffering in particular. In April 2018, the Council of Common Interest (CCI) approved the National Water Policy (NWP) of Pakistan which aims to achieve efficient management and development of water resources, equal distribution of water in various areas, measures to minimize the rapid decline in ground water levels, increase in crop production by implementing effective irrigation techniques, steps to ensure availability of clean drinking water, institutional reforms to make the managing organizations more responsive, and steps to minimize cost and time of completion of water sector projects. Pakistan is neither the first country nor the last to suffer severe water shortages. Since 2014, Cape Town, Capital of South Africa, is suffering from drought and water shortage. These years of severe droughts have depleted the city’s water reservoirs and the largest reservoirs went from being at full capacity to just 12% of their total capacity. But the city is solving the issues by constructing new wells, an effluent recycler, and four desalination plants. These projects are already halfway toward completion. Most importantly, the city has also been working on educating the people on reducing their water consumption and wastage of all sorts. This has resulted in a 50% drop in water consumption from 2015 to early 2018. In 1965, when Singapore became independent from Malaysia, water shortage was the greatest threat to the existence of this state. With no natural aquifers and pollution in its river, in just five decades Singapore has overcome water shortages. The strategic planning and continual investments in water research have led to the development of alternative water sources that are commonly known as Four National Taps. These sources of water include water from rainwater collection area, imported water from Malaysia, recycled water, and desalinated water. There are many other success stories like these and if we look at what these countries have done, we will observe that many solutions already exist to overcome water scarcity. Now it is up to us to take immediate action and devise effective and impactful policies to tackle the water crisis. By saving water, we can save ourselves from a severe drought, loss of crops, and an extreme shortage of hydro-electricity, but most importantly, we can secure the future of our next generations. The article has been co-authored by Musawwir Abrar, a Civil Engineering student at UET, Lahore. Previous articleZero Divided By Zero: Is There More To It? Maliha is a student of electrical engineering at University of Engineering and Technology, Lahore. Are we ready for a gene-editing future?